Sometimes when you purchase your sewing machine there are some items which have not been included. These are the accessories available for purchase for your sewing machine which you may not have had an initial need for. 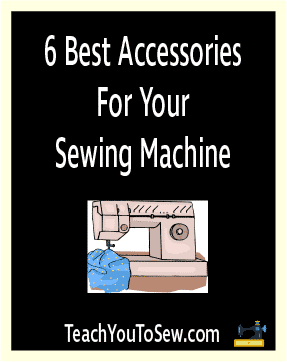 As your skill set in sewing grows, you’ll begin to realize that there are items which are essential for the maintenance of your machine which you now need. Or, that there are other accessories which will be essential to a current project or would help it go a lot smoother. One of the first things you might want to consider when it comes to the storage of your machine is protection from dust. Most new machines have a soft cover included in the list of accessories you would have received at the time of purchase. The situation changes though when you need to transport your machine from one place to another and want to ensure that is adequately protected. Although a branded machine case, it is really designed to fit any free arm sewing machine. I find it even more interesting that a case which fits regular sewing machines can also fit most sergers, which tend to have a compact and bulky appearance. It is made of molded durable plastic and is comprised of two parts, the upper cover and the lower base. Between the base and the upper cover the total closed dimensions are 19.6 x 12.7 x 12.5 inches. It is made with two metal hinges which lock on the narrow side of the carrying case and a handle at the top of the cover. Quite easy to clean, this case serves the dual purpose of storing your machine when it is not in use and safely transporting it. This ensures that is kept safe from dust and the elements and is protected during transport. 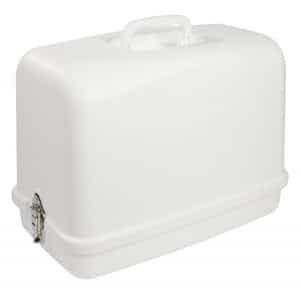 This next universal carrying and storage hard case is designed to fit most free arm sewing machines and sergers also. 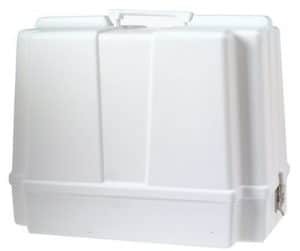 Its dimensions are a little smaller than the previous, being: 17” L x 8 ½” W x 12” H.
The upper casing has a fold down handle and the secure metal latches lock onto the bottom tray on either side of the narrowest section. The edges of the case have been smoothed out, and although white, is easy to keep clean. The hard case is designed to be impact resistant so you can feel confident that your machine is being adequately protected. Although it might seem a bit daunting to do, after a while if not properly maintained, your machine will cease to function well, if you fail to keep it well lubricated. I have had to keep my operation manual near to guide me through the process, since not everything which appears to need oil does. The manual is very clear on where to oil and how many drops should be deposited at each section, so do not neglect this aspect of caring for your machine. This machine oil will help to reduce the friction between the moving parts of your machine and keep it running seamlessly. It also prevents rust and excessive wearing, which gives longevity to your machine. 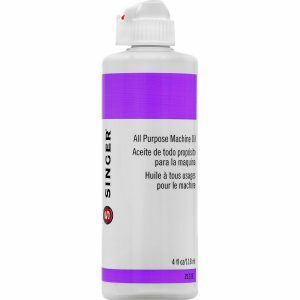 The 4 ounce bottle will last for years since you will only be using a small amount each time. The frequency with which you oil your machine will also be dependent on how often you put it to use. Here’s our guide on how to oil a sewing machine. I think this specialty walking foot is as essential to a sewing machine the way the differential feed is essential to an overlocker sewing machine. This foot is a huge stress reliever when you are working with several layers of problem fabric. It provides just the right amount of control and even feeding for a really neat result. Quilters will find this foot especially useful since they commonly work with multiple layers of fabric. This foot also helps sewers to achieve precision when lining up patterns and when working with fabrics with nap or pile. It is made to work with low shank machines such as Babylock, Bernina, Brother, Elna, Euro-Pro, Husqvarna Viking, Janome, Juki, Kenmore, Necchi, New Home, Pfaff, Singer, and Simplicity. If you are the owner of a Brother sewing machine, you will find this next presser foot most helpful. This genuine made brother part appears to work mainly with brother sewing machines and overlocker machines but may be helpful for a few other brands. 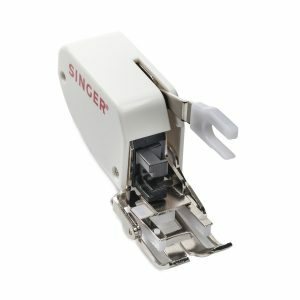 It is perfect for quilting and also sewing seams at the edge of fabrics which normally get chewed up by the feed dogs. The blade at the edge prevents the fabric from being pulled down into the machine. 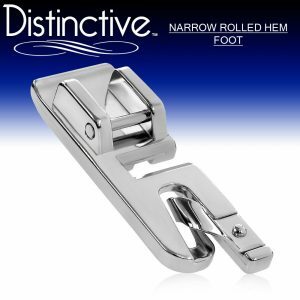 For finer fabrics, this foot allows for the straight stitching of narrow ¼” seams. 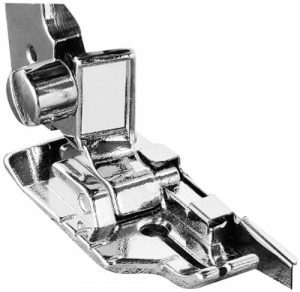 This universal presser foot helps in the formation of rolled hems on lighter fabrics. It is a very well made, high quality precision foot and eliminates the tedious hand work which would have to be done otherwise. The instructions for use can be found on the packaging and it is designed for use with low shank snap on machines. The known brands with which it works well are: Singer (Some Singers Require A Low Shank Adaptor), Brother, Babylock, Euro-Pro, Janome, Kenmore, White, Juki, New Home, Simplicity, Necchi and Elna Sewing Machines.